Families in Woodbridge are fighting plans to bring a gun shop to a shopping plaza. There is still no decision on whether zoning changes will be approved to allow a gun shop near a teen center in Woodbridge. On Monday night, the Woodbridge Plan and Zoning Commission heard from dozens of residents who said this is not the kind of business they want moving into town. For many, the objection is the location. The Selden Street plaza sits about 100 yards from the Amity Teen Center. “Why would you chose that spot?" Jane Opper asked. Dozens of residents said Woodbridge Firearm Trading Post is not the kind of business they want moving into town. The people proposing it said they have taken several safety measures. Francis Klos and Mike Majewski want to open Woodbridge Firearm Trading Post. They received federal approval last month and that’s when they realized the location they selected in the plaza was not zoned for retail space. Meanwhile, other stores in the plaza have that designation. 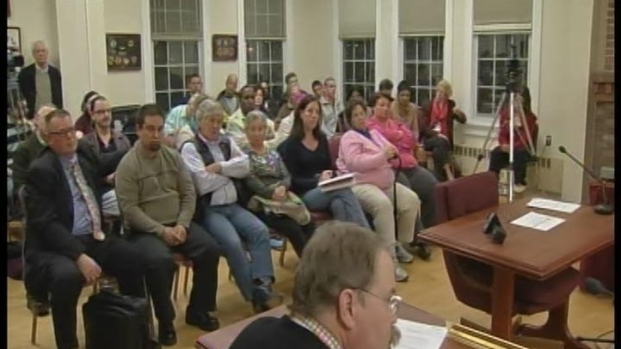 It’s a change that many in town are fighting, including Board of Selectmen member Susan Jacobs. While most of those crowding the meeting oppose a shop bringing guns to town, one of the store’s potential neighbors in the plaza said there has to be a distinction between legal and illegal use and ownership of guns. “It’s the people who are law-abiding citizens that are trying to protect themselves that are buying guns from a gun shop,” Ralph Ferrucci, owner of the Winchester Restaurant, said. Klos told NBC Connecticut he was associated with the The Perfect Trigger, a gun shop in North Branford, when it was broken into last year. Five semi-automatic guns were taken in a smash and grab. He said the security at that location didn’t go far enough but the Woodbridge store would be covered in cameras, alarms, gates and other safety features. “When we decided to open up the store, we went beyond security, went beyond what was necessary,” Klos said. The commission is taking another month to look into the zoning issues.